Provides natural nutrients for stimulating the body’s detoxification mechanisms. Used for alleviating chemical dependency. 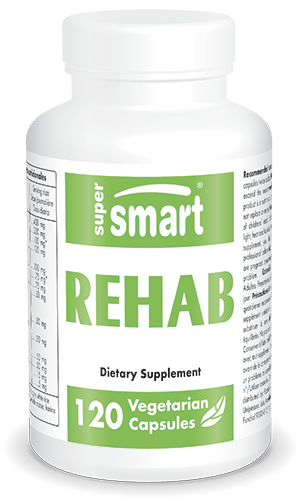 The natural nutrients in Rehab act in synergy to stimulate the body's detox mechanisms and alleviate chemical dependency. ¤ Chrystantellum americanum promotes bile secretions, has a beneficial effect on kidney stones and gallstones and protects the liver. It stimulates liver function, enabling alcohol, in particular, to be eliminated two to five times faster. ¤ Vitamin C neutralises free radicals generated during phase 1 of detoxification. It helps degrade toxins (pollutants or drugs) and eliminate them via the urine as well as reducing heavy metal toxicity. ¤ Supplementing with N-acetyl-cysteine increases glutathione levels. Phase II detox involves conjugation reactions in which glutathione plays an important part: a glutathione molecule binds to a toxin and thus facilitates its excretion via bile or urine. ¤ Asparagine supplementation can reduce concentrations of acetaldehyde in the blood by more than 30%, thus preventing alcohol toxicity. ¤ Kudzu contains flavonoids (puerarin, diazin ou daidzein) which help reduce damage resulting from excessive alcohol consumption. These flavonoids are believed to work by stimulating activity of the alcohol deshydrogenase (ADH), thus reducing alcohol concentrations in the body. ¤ Calcium D-glucarate's detoxifying effect comes from its ability to increase glucuronidation and excretion of potential toxins. During phase II of detoxification, carcinogenic chemicals, steroid hormones and other fat-soluble toxins bind to glucuronic acid in the liver (glucuronidation). ¤ Dimethylglycine plays a part in hepatic metabolism and detoxification due to its ability to donate methyl groups to help produce sulfur-adenosylmethionine (SAMe). It also has a direct role in detoxifying foreign substances. ¤ Curcumin counteracts the hepatotoxic action of xenobiotic substances by increasing both the liver's detox capacity and levels of the enzymes glutathione-S-transferase and UDP glucuronyltransferase, which are important for phase II reactions. Curcumin reverses aflatoxin-induced liver damage. Bioperine® increases the bioavailability and efficacy of curcumin. - binding directly to certain toxins, rendering them harmless and promoting their excretion. ¤ Ginger root extract increases bile secretion. Combined with silymarin (milk thistle), it is effective at combating hepatoxicity induced by carbon tetrachloride. ¤ Silymarin is hepatoprotective. Daily supplementation with silymarin improves liver function in individuals with liver disease (including exposure to toxic levels of industrial phenols such as toluene). Silymarin increases levels of glutathione and glutathione peroxidase in patients with liver disease. It is also a powerful antioxidant. ¤ Sodium R-lipoate is a highly bioavailable salt of R-lipoic acid. Alpha-lipoic acid supports liver function by neutralising free radicals and promoting production, regeneration and concentration of glutathione in the liver. Alpha-lipoic acid induces phase II enzymes. It also promotes bile excretion of heavy metals. For optimal detoxification of the body, other dietary supplements may also be of interest, such as Colon Cleanse Formula, a blend of natural extracts formulated for cleansing the colon. There’s Cruciferous Detox Formula for helping to detoxify the liver, and Lectin Flush, useful for eliminating lectins, molecules associated with certain food sensitivities or hypersensitivities. Excipients: Microcrystalline cellulose, magnesium stearate, silicon dioxide. Bioperine® is a registered trademark and proprietary product of Sabinsa Corporation.